Posted December 4th, 2018 by dio. Categories: Event Marketing, Experiential Marketing, Sampling & Product Demonstrations. 3…2…1…Blast Off! Product launches are very exciting times for a company or brand. You’ve worked tirelessly to research, design, test and package a new product. Production is ready to commence. But…it’s too soon to pop the cork just yet. First, you need to give your product a proper inaugural debut. Experiential marketing is an effective way to raise awareness, trigger product trials, generate interest (and buzz) and excite your key audience into purchase consideration. Hosting a live event takes planning and effort to get just right. The live event is just one piece of the overall product marketing plan. (But it’s our favorite!) Product launches are most successful when you understand the entire plan. As you define the product launch objectives, consider how you’ll tackle each one in the launch design. For example, if you want to generate media pick-ups, how will you give the press exclusive access? If you want to create social buzz, how will you encourage on-site sharing? If you need to generate a marketing list, how will you offer a value exchange for consumer data? If you want to collect pre-orders, how will you enable trial and ease of sale? Product launches accomplish many things. But understanding the main goals will direct your planning (and budgeting) strategically. Was it curiosity that killed the cat? Oh, who cares?!? Curiosity is exactly what you need from your audience when you’re planning to release a new product. Run teaser ads or push out content socially that hints about what is coming – without spoiling the surprise. 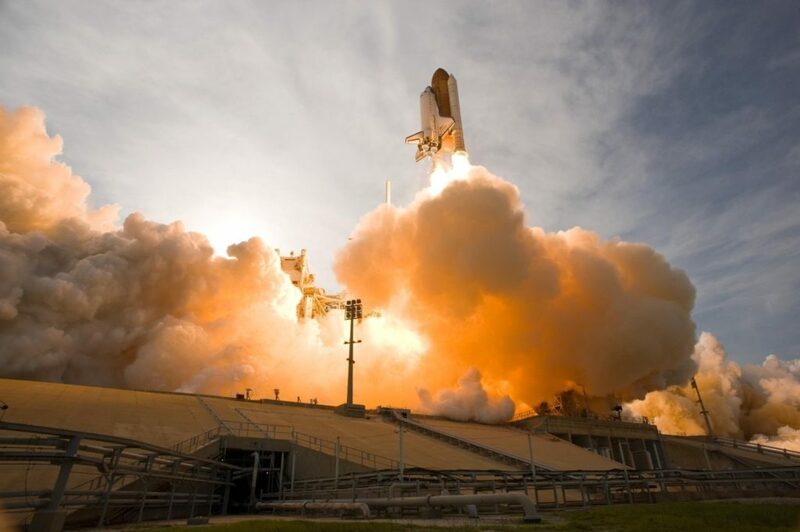 What you don’t want to happen is to plan a product launch event – and no one comes. Or worse, you roll out the new product – and no one clicks ‘buy’ on that first day. The suspense you build will create urgency once the product is stocked and shelved. Tick, tock. Timing is everything, as they say! Your product launch party should align with your product release date. If it’s not on the same exact day, you can book it a few days prior to help build the suspense (see #2). We don’t recommend calling an experience a “launch” once the product is widely available for purchase, unless you’re doing a mobile tour from market to market and need to stretch the events across multiple dates. Many brands opt for their product launches to coincide with an industry event or trade show. For example, FOREO unveiled the UFO at CES. The convention provided a large audience and media presence for their latest beauty product. Make a clear association between your product and the larger event. The connection must be appropriate and make sense for your objectives. Other brands want to fully own their product launch party. Timing the event based on seasonality or audience needs could be beneficial, depending on the category of product. Planning for your product launch event will likely take several months. So timing is also key in knowing when to start releasing your teaser content, when to invite your guests to the party and when to send media all of the embargoed content. You’re definitely going to want to input key dates on a calendar to follow. Automate any tasks in advance, based on that calendar plan. Check in regularly with the product team to ensure production and release date are on track. If production timelines shift, your launch date may be affected. We heavily rely on email and digital marketing to promote product launch events. However, at times, a direct mail piece or a hand-delivered invitation is worth the extra cost and effort. A tangible invitation is hard to ignore – and can’t be deleted. Video invitations might also kick up your email campaign a notch. For media, especially, press kits with a creative invitation will encourage coverage. Plan a media blitz to deliver the press kits to those news directors, reporters or journalists who are most likely to cover your industry. When marketers talk about location, they consider high traffic areas and proximity to the key audience. But event planners know that isn’t the only thing you need to consider about selecting a venue for your product launch. Does the space offer a well-fitting gallery for your product to be on display? Does it produce the right vibes? Does it offer the character your new product demands? Based on the experiential marketing elements you’ll be incorporating into the event, does the space provide the right functionality and lighting? From convention centers to urban loft rentals, the spaces you choose for your product launches must match your brand’s personality and entice your audience to attend. Everyone – from registration to catering to product demo – who is working your launch event should be experts on the new product. Depending on the product, itself, and its complexity, training could take place in a number of ways. Whether a week-long training workshop, a virtual webinar or through product literature, arming the team with the details of the new product is key. When an excited attendee asks any of the staff a question, they should receive a thorough, knowledgeable, helpful response. Prepare your staff. Product specs and features are obviously important. If you’re hiring brand ambassadors for the event, then brand training is just as important. Product launches don’t solely suppport the product marketing team; they are a full-fledged brand experience. Your staff need to understand the positioning, attitude and core messaging at the brand level, too. For some brand experiences, we recommend subtle brand placements. Yet, for product launches we suggest screaming the brand loudly. Logo signage, brand name call-outs and impactful color schemes will ensure no one will forget who owns this new product. This is especially true in very competitive industries. Small brands and start-ups will also benefit from big, bold branding. If your new product has its own name/brand, find the balance between parent company and product brand. If an attendee posts about the event or writes a journal review, you’ll want to make sure they’re crediting the right people behind the new product. So you’ve gathered your target audience, industry influencers and media professionals – now what? Product launches need to need to provide an opportunity to experience the new product. Your product should be front-and-center and offer interactive engagement with guests. Product launches should always include unique sampling or demonstrations. Some products are easier than others to design a trial around. Grocery CPGs can serve a menu inclusive of the latest line of tasty products. A new electronic device can be showcased at interactive stations. Or a shoe can be tried on and tried out using a treadmill. Larger, expensive or cumbersome products are sometimes harder to trial. However, there are solutions. For example, a new airline jet could use virtual reality to help transport guests into the air for first-class service. Product launches are designed to encourage product trial. Make it easy for your guests to get their hands on your product, literally. I talked a bit about pre-event buzz (see #2) already. Now let’s talk about how your product launch is going to generate earned media for your product, itself. Your product launch doubles as a press event. Package up the product story to make it as easy as possible for media. Allow for media interviews and provide ample ways for them to ask questions. Leverage your influencers. Treat them to share-worthy experiences, so they talk about your event and product authentically. Providing some canned content might be useful for a high-tech product, but I’m a fan of the more organic style conversations. Don’t over-control the influencers’ voices. Experiential marketing and social media go hand-in-hand. Attendees will be snapping photos, creating video content and sharing their experiences socially. Check out our 10 Tips to Designing an Instagrammable Event. Consider live streaming your product launch event, or some of it. Perhaps you have live product demonstrations you stream online. Or you have a spokesperson giving online viewers a tour of the event and the new product. If your audience can’t all be in the room, provide ways for them to still feel like they are there with you. Earned media is a valuable outcome for your product launch. Designing it with that in mind will help create brand-approved chatter across many channels. Open bars, balloons and happy brand ambassadors make a pretty party. But product launches are a source for information. Don’t skip the education, but do it in an entertaining way. Your attendees are there to learn about (and to trial – see #8) your new product. For them to fall in love with the product and apply its uses in their own everyday lives, they have to know a thing or two about it. Google invited attendees to live a “Google day” to roll out their new smart assistants. This was an informative way for their guests to learn about the products, trial them and also be entertained. Maybe you skip the CEO 20-minute lecture on the benefits (or maybe you don’t). Activision opted to feature an hour-long keynote when they rolled out their new Destiny 2 game. Maybe instead you have a dueling pianos show where the performers sing out the various features of the new product, as a thought starter. The complexity of your product will define the level of infotainment you need. Let’s take healthcare, for example. Experiential marketing for healthcare products can make understanding less overwhelming for your prospects. An interactive product launch experience can certainly have its benefits across many industries. It’s about delivering the new product details in a creative way. Gimme, gimme! Attendees love freebies. Marketers love having their brand leave an event with someone. The right takeaways at the end of the event can lengthen the impression and maximize impact. Choosing the right swag takes creative thought of its own. Whatever you give away – whether a physical item or digital content – must tie directly to the product and your key messaging. If you want to give away the latest tech gadget just ‘cuz it’s cool, you’re wasting your money. The best takeaways get a consumer thinking about your product and your brand every time they look at it. Product launches are brand experiences that fuel your content factory. You’ll generate user reviews, earned media and content your product marketing team can reuse for months to come. Another way to think about content is experientially. What type of content can your guests interact with – either at the launch party or afterward? Perhaps you want to embed the packaging of your new product with NFC to deliver engaging digital experiences to your attendees when they use the new product. Maybe you create a series of interactive videos delivered to attendee emails, where each recipient can choose their own story ending. Or you use kiosks throughout the event space to allow attendees to play and customize their content consumption, from testimonials, tutorials or themed playlists. Experiential marketing is content-centric. Designing your content plan around the experience, and vice versa, the live event becomes a key stop along the consumer journey. Product launches spike excitement at the time of product release. If the product sells out in the first week, great. You can continue to nurture your subscriber list to keep them excited until the next batch rolls off the production line. But what happens in month six when the excitement has worn off? Well-timed brand experiences throughout the product’s entire lifetime can keep the excitement high. They also offer the brand opportunities to collect consumer feedback and continue nurturing relationships. A brand experience isn’t a one-and-done. Product launches shouldn’t be one-night stands with your brand. Continue to give product users new experiences at every touch point. Product launches should be fun! Be sure to include lots of celebratory, feel-good moments during the launch event. Joyfulness should be in the air as you celebrate your new product. No matter how revolutionary the item or service is, this is a milestone for your product marketing team. As such, celebrate! Now it’s time. Pop the bubbly, say a toast and spread the cheers! Product launches are critical marketing projects that require expert-level care. Let us help! As specialists in experiential marketing, your live event marketing is important to us. Give us a call to start planning your product launch today.